Bring large pot of water to boil. Cook spaghetti to al dente and drain. Remove hot pot to burner. Melt butter and saute onions until softened, about 5 minutes. Stir in flour and cook 2 minutes. Slowly whisk in chicken broth and milk to prevent lumps. Increase heat to thicken sauce. Sprinkle in grated cheese and stir continuously to melt into sauce evenly. 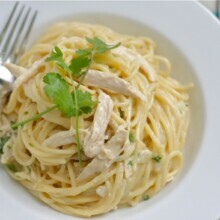 Stir in cumin, salt, pepper, jalapenos, jalapeno juice, chicken, cooked spaghetti and cilantro. Toss to coat everything evenly in sauce. Taste and adjust seasonings. Serve warm with more cilantro.